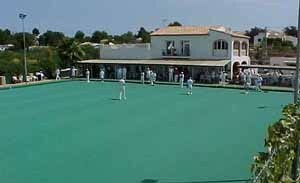 Javea Green Bowls Club is located near the village of Benitachell, about 10 mins. drive from the picturesque resort of Javea, Northern Alicante. 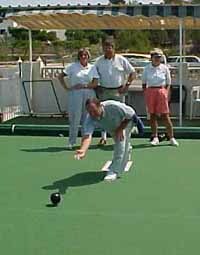 Javea Bowls Club is located near the village of Benitachell, about 10 mins. 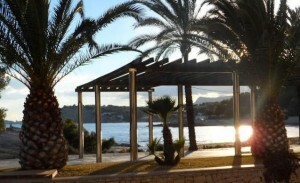 drive from the picturesque resort of Javea, Northern Alicante. The Javea Bowls Club has 9 rinks. Club days are Tuesday-Friday & Sunday mornings. There is a club house providing bar facilities and snacks during the day. 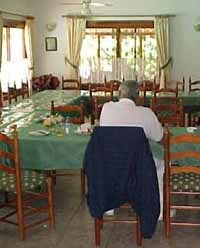 The Club house also has an excellent dining room which is available for private functions seating up to 70 people. The club sports a two rink practice green overlooking the main green. This probably helps Javea Green maintain its impressive competitive record! The restaurant section of the clubhouse. Bowlers use this side terrace to relax while taking refreshment. 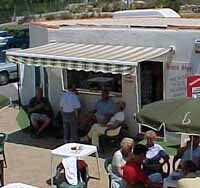 Javea bowls club has A well stocked Bowls Shop is located on one side of the terrace. Andie and Stella stand ready to serve a cool drink or snack from the bar at Javea bowls club. Visitors’ Green fees – €10 per day. Bowls/Shoes hire included. 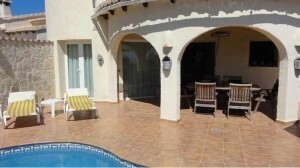 Detached holiday home with private swimming pool, peacefully situated on the hills of La Cumbre del Sol on the Costa Blanca. 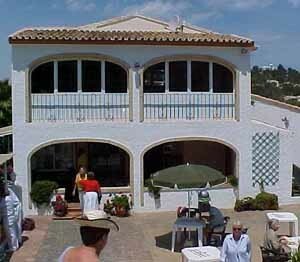 Javea Green Bowls Club Inn On The Green.